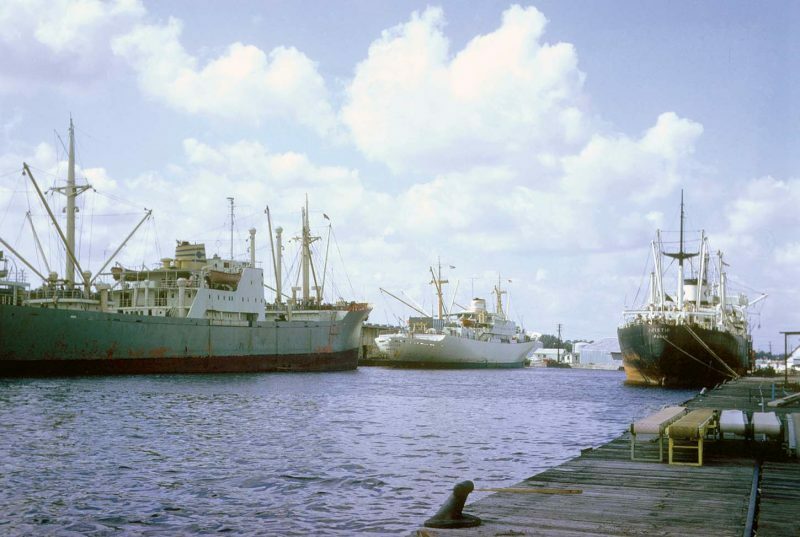 Jacksonville is a natural seaport and city that sprawls over a huge 840 square miles, making it the largest city and port area in the United States and the most populous in Florida. It spreads out along three meandering rivers and includes a wide entrance from the Atlantic and the Intra Coastal Waterway, a feature running along almost the entire length of Florida. The city has three bridges over the St. Johns River, the Fuller Warren Bridge, the Acosta Bridge and the Main Street Bridge, with the Hart Bridge and cantilever Mathews Bridge, opened on 15th April 1953, crossing just downstream of the city, and the cable stayed Dames Point Bridge opened in 1989 also crossing the river half way to the sea. Jacksonville is some seventeen miles distant from the sea due west, twenty one miles by the winding river. 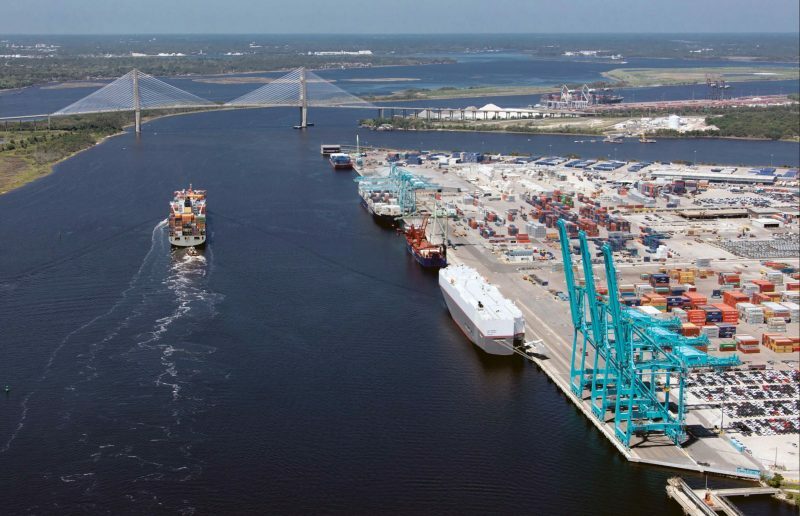 Jacksonville Port Authority (JAXPORT) is a modern port governed by a Board of Directors, and it owns and operates three container and cargo terminals and one cruise terminal, with annual traffic at around 8.5 million tonnes. Mitsui OSK, Hanjin, NYK and forty other container ship lines, together with Carnival Cruise Lines and Royal Caribbean International cruise ships, are to be seen in the port. The local residents call their city simply ‘JAX’ and it is prosperous with heavy industry including the largest brewery in the world, paper mills and big naval bases. The Port of Fernandina Beach is forty kilometres to the north of Jacksonville with its entrance channel from the Atlantic forming the Georgia and Florida State border. The Timucua tribe created the first permanent settlement in the Jacksonville area more than six thousand years ago. The first white European settler was French Huguenot (Protestant) explorer Jean Ribault in the mid 16th century, establishing Fort Caroline in 1564 with two hundred settlers. Spanish conquistador Pedro Menendez de Aviles destroyed the fort a year later, killing all the French soldiers except Catholics. The fort was ceded by the Spanish to the British in 1763 but they returned it to Spain twenty years later. The United States of America acquired Florida in 1822, and a year later the nearby town was named Jacksonville after President Andrew Jackson (1767-1845), the seventh American President between 1829 and 1837, and the first Governor of Florida. Andrew Jackson was born at Waxhaw (South Carolina) and settled in Tennessee and represented the slave holding South. He owned over one hundred slaves to work his cotton plantation, The Hermitage, at Nashville. He traded slaves to other plantation owners and became Commander of the Tennessee Militia, leading campaigns against the Native Indian Creek (Muscogee) tribes of Georgia, Alabama, Louisiana and Florida. He was known as ‘Old Hickory’ to his troops and was ruthless in the slaughter of Native Indians, particularly the Creek Indians. The Creek War (1813-1814) began as a civil war within the Muscogee nation, but General Andrew Jackson used it as an excuse to wage war with his five thousand regular troops. He defeated the Creek Native Indians at the Battle of Horseshoe Bend on 27th March 1814. He became a national hero when he defeated the British at the Battle of New Orleans on 8th January 1815 in the last British campaign in North America. He then fought the Seminole Indians between November 1817 and July 1818, and was even more ruthless in the annexation of their lands, even taking the land of those tribes that had fought on his side. At this point, he had taken all of the native Indian land of Georgia, three quarters of their land in Florida and Alabama, and one fifth of their land in Louisiana and Mississippi. He took Pensacola in Western Florida in May 1818 from the Spanish, and then most of Western Florida. He was then ordered into Eastern Florida to pursue the Seminole Indians and also took several Spanish forts and deposed the Spanish Governor of Florida. This culminated in his effective annexation of Florida from Spanish control, and he became Military Governor of Florida Territory in 1821. The Indian Removal policy of General Jackson to a line west of the Mississippi had been completed by 1830/32, in the first years of his Presidency, but the remaining Seminole tribes in Florida fought on, with the annihilation of a troop of one hundred U.S. soldiers in December 1835. It took much more money and troops to finally quell the Seminoles by 1837, the last year of his Presidency. The Florida legislature approved the Jacksonville port charter in 1832, but port growth was very slow due to the American Civil War. Jacksonville was an important supply port for the Confederate Navy and Army in their quest to preserve their way of life, but was occupied and burned several times during the war. Union troops landed at Jacksonville and fought the Confederate Army at the Battle of Olustee, the only Civil War battle in Florida, on 20th February 1864. After bitter fighting, the Union troops retreated with heavy casualties to Jacksonville, and two U.S. transports, Maple Leaf and General Hunter, were sunk in the St. Johns river shortly afterwards.